Take control of this gigantic All Terrain Armored Cargo Transport with your smartphone and recreate the biggest battles and missions in the Star Wars saga with the Star Wars Rogue One Rapid Fire Imperial AT-ACT Vehicle! The menacing AC-ACT from Rogue One: A Star Wars Story fires projectiles, includes three 3 3/4-inch action figures - C2-B5, Jyn Erso, and an Imperial AT-ACT driver - and features a removable cargo bay that becomes a playset. It doesn't get any better than this! Includes 1 vehicle, 3 figures, 1 accessory, 4 projectiles, and instructions. This towering movie-inspired, app-controlled vehicle converts into an action-packed playset so kids can create their own Star Wars adventures. Also included are 3 unique 3 3/4-inch figures from the film so fans can imagine sending their favorite heroes and villains into the intergalactic fray. Droid C2-B5, an Imperial AT-ACT driver, and Sergeant Jyn Erso battle for control of this amazing war machine. 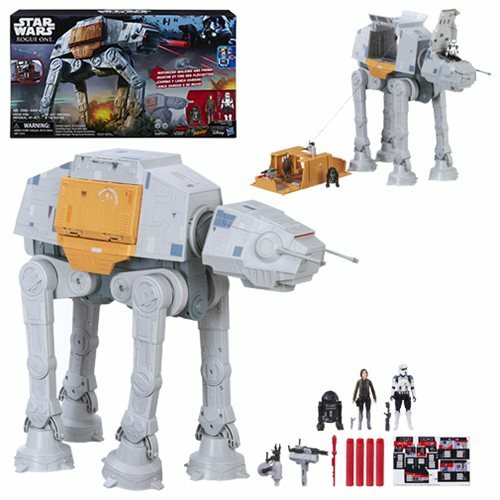 No Star Wars collection is complete without this Star Wars Rogue One Rapid Fire Imperial AT-ACT Vehicle! Requires 4x "D" batteries, not included. Measures approximately 18-inches tall when fully assembled. Ages 4 and up.